Next generation vintage British sound at you hands.. The DSL models feature adjustable power settings, which delivers all-valve tone and feel, at any volume, from bedroom to stage. This technology adjusts power to the valves, instead of just turning off valve stages, allowing the amp to remain articulate and dynamic. Marshall's partnership with Softube has led to the creation of award-winning plug-ins, as well as exceptional tone in its CODE digital amps. The same team is responsible for the development of the new emulated output feature, found in the DSL series. 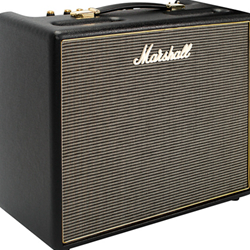 Both the headphone out, and line out on the DSL models boast incredibly accurate emulation of Marshall's famed 1960 cabinet. The DSL is now more versatile than ever, with features including discrete master volume controls for each channel, built-in reverb and resonance controls (the DSL1 and DSL5 do not offer resonance controls). Additions to the range include the DSL1 head and combos, which offer all-valve Marshall DSL tone in a smaller package, plus a DSL20 combo and head.